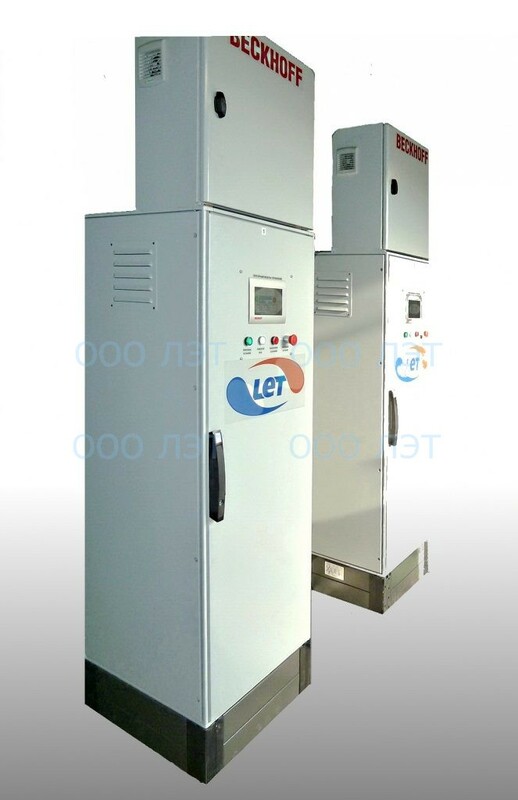 AQUACHLOR is the General name of the line of electrolysis equipment made by LLC “LET”. 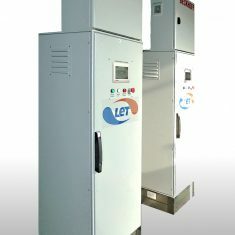 “AQUACHLOR-BEKHOFF” is fully automated equipment for the production of chlorine-containing reagents by electrolysis of sodium chloride (salt). 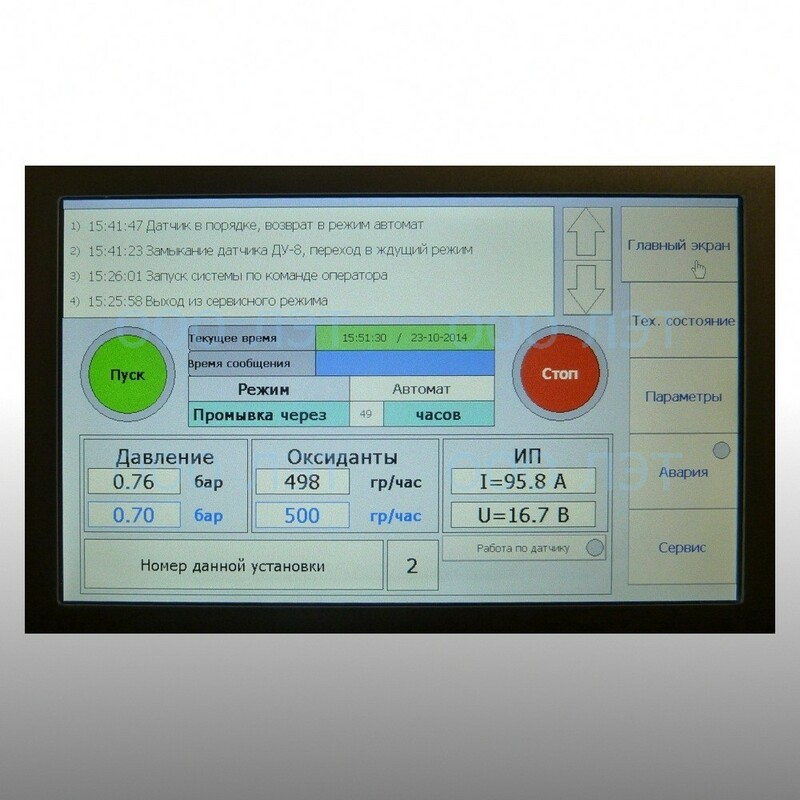 The automation and dispatching system implemented in this equipment allows you to control the operation of the installation remotely from a computer or tablet operator. 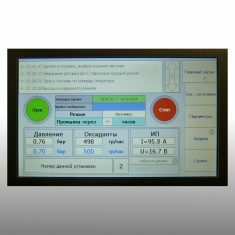 If necessary, at the request of the Customer, the specialist of our company can remotely perform the adjustment of the operating mode of the equipment. The range of basic equipment “AQUACHLOR-BEKHOFF” is 12 kg of active chlorine per day. 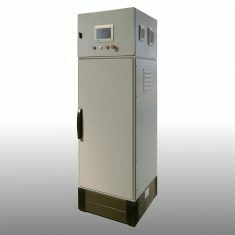 Equipment “AQUACHLOR-BEKHOFF” can be installed in a complex, which allows producing any concentration of active chlorine. In the GALLERY section of our website you can learn more about our equipment. Installation complexes are presented in the INSTALLATIONS section. We invite you to contact with the specialists of LLC “LET” to make a suitable choice for you. You can contact us by any comfortable way and we will be happy to give you any consultation about our equipment at anytime. If you have doubts about your choice, we can offer you to fill THE QUESTIONNAIRE. 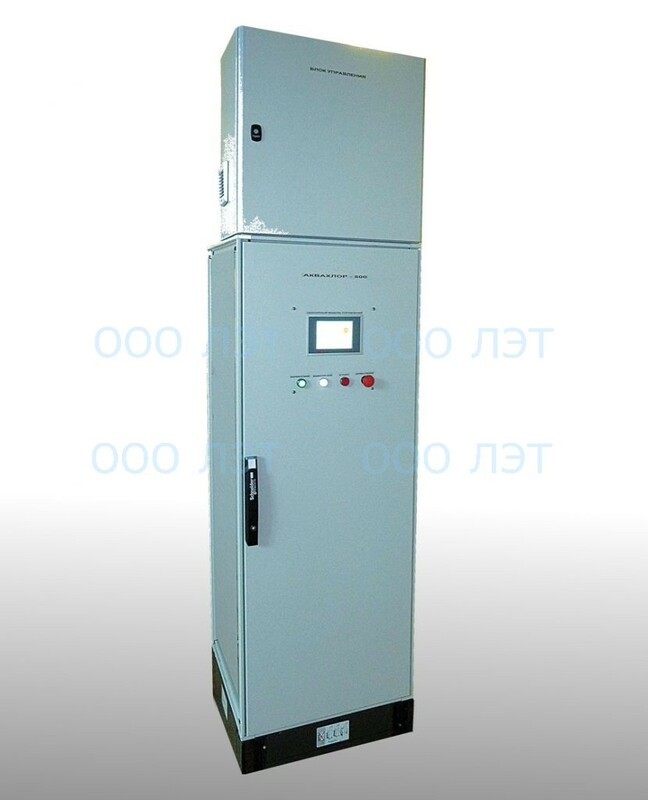 The principle of diaphragm electrolysis is realized in the equipment “AQUACHLOR-BEKHOFF”. 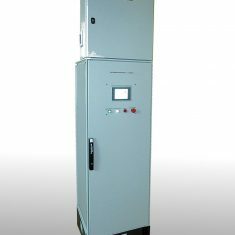 Sodium chloride solution goes to the device reactors, where during the electrochemical reaction process chlorine (with small amount of chlorine dioxide and ozone), hydrogen, sodium dioxide (alkali) are formed. Electrodes of the reactor are separated by ceramic porous diaphragm, which allows reaction products to be separated. Chlorine-containing substances mix with water and form oxidant solution with pH=3, which is used for water disinfection. Hydrogen is diluted with air and removed from the room. Alkaline catholyte is removed by separated flow from the device. Catholyte is used as a reagent for the stabilization treatment of water. If necessary, you can get a neutral oxidant solution, which is similar to sodium hypochlorite with pH=6-7, by using any model of “AQUACHLOR-BEKHOFF” equipment. This does not require changes in the design of the equipment. Sour oxidants solution (5 gr/L of active chlorine). Due to pH level of the reagent and in addition to chlorine ozone and chlorine dioxide, acidic oxidant solution is the most effective for water disinfection. It is characterized by minimal formation of organochlorine compounds. Neutral oxidant solution (5 gr/L of active chlorine). It is the same as sodium hypochlorite. During the working process alkaline solution isn’t formed. Equipment “AQUACHLOR-BEKHOFF” is intended for production use reagent for the disinfection of water. Production of own reagent allows to reduce the cost of disinfection, avoid expenses for transportation and storage of dangerous reagents. On the places of preparation of household-drinking water. On water treatment facilities for technical purposes. Oxidant solution can be used as the only reagent for disinfection, as well as in combination with ultraviolet devices to maintain the sanitary condition of buildings and ensure the safety of water during transportation to the consumer. Please note that, that for the equipment “Aquachlor” as a raw material for the production of reagent can be used cheap salt of technical quality. If you want to use low-grade salt as raw material, please indicate this when filling out the questionnaire.